You Are Here Photocopiers How Does a Photocopier Work? You may think that the process of photocopying a document is really simple – you take a document, put it on the glass screen of a photocopier, a green light passes along the glass and after a few seconds, an identical copy of the document you placed on the screen comes out of the side of the machine. But have you ever wondered what goes on underneath the glass? Photocopiers are actually quite complex pieces of machinery, here is our very simple guide to how a photocopier works. When was the photocopier invented? Chester Carlson invented the photocopier in 1938, but he called the process electrophotography. 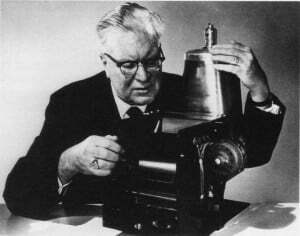 It took 10 years for his invention to be recognised, and in 1948 electrophotography was renamed to xerography. In 1949, the company Xerox was born and they released the first plain paper copier – Model A. The functions and capabilities of modern photocopiers are vastly different from the original Xerox machine, with the ability to print on two sides of the page (duplex), staple documents, create booklets and send scans and faxes, all at the touch of a button. So how does a photocopier work? After you’ve put your piece of paper (the master copy) on the glass screen of the copier and pressed the big green button, the machine takes several steps before your copy comes out. Photocopiers work on the principle that ‘opposites attract’. Toner is a powder that is used to create the printed text and images on paper. The powder is negatively charged, and so it is attracted to something positive – the paper. The drum, which is located in the heart of a photocopier, is positively charged using static electricity. An image of the master copy is transferred onto the drum using a laser. The light parts of the image (the white areas on a piece of paper) lose their charge so become more negative, and the black areas of the image (where the text is) remain positively charged. The toner (being attracted to the positive areas) sticks to the black areas of the image on the drum. For colour copies, the drum attracts the cyan, magenta and yellow and black toner. From these 4 colours, a wide spectrum of colours can be formed. The resulting toner on the drum is transferred to a piece of paper, which has a higher negative charge than the drum. The toner is melted and bonded to the paper using heat and pressure rollers. Then, finally your photocopied document comes out of the copier. Because heat is used, the paper that comes out of a copier is warm. Midshire have been supplying photocopiers and printing equipment since 1990. Our engineers and technicians are trained to the highest manufacturer standards on Ricoh, Sharp, Lexmark, Toshiba, HP and RISO machines.